Cups, plates and awamori containers by Paul Lorimer. Paul Lorimer, and New Zealand born potter who has made Japan his home since 1977, and is currently living and making his artifacts in Sashiki, Nanjo City, is having an exhibition and sale of his wares in Nishimui Nishimori Fine Arts Gallery in Kochinda. Lorimer’s work consists mainly of pots, cup and plates meant for everyday use with vessels for sake and awamori being his specialty. He says that the texture of clay determines what he’s making. “I decide what to make after feeling the clay, as that’s a natural way of creating works,” he states. Lorimer first came to Japan to study pottery in Bizen, Okayama Prefecture, back in 1977, but he soon discovered that the climate in Bizen was too cold to his liking. He then moved to Ishigaki where he worked 16 years making pottery while at the same time working odd jobs to support himself. 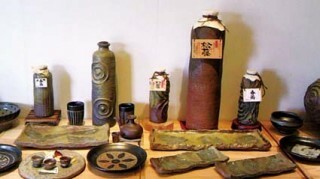 His pottery finally got recognition in 1991 when he won a grand prize of the Okiten Exhibition main section. 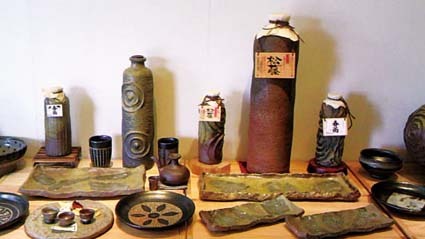 That led to a demand for his wares, and to meet that demand he moved to Sashiki on Okinawa’s main island in 1996, where he now has several kilns. The exhibition opens today and will run a whole month until Nov. 11. The gallery is open from noon to 5 p.m. every day except on Mondays when it’s closed. Admission to the gallery is free. To get to Nishimui gallery drive south on Okinawa Expressway following signs to Naha Airport. Get off at Haebaru Minami (South) exit and turn left on route 507, and go to Kochinda. When reaching Kochinda intersection turn right (at the second traffic light) onto Route 77. The gallery is on the right side of the road about 500 meters after the turn.